We are happy to announce the 6th edition of “Asymmetrical Planetary Nebulae”. The last edition took place in the Lake District (United Kingdom) 20-25 of June 2010. 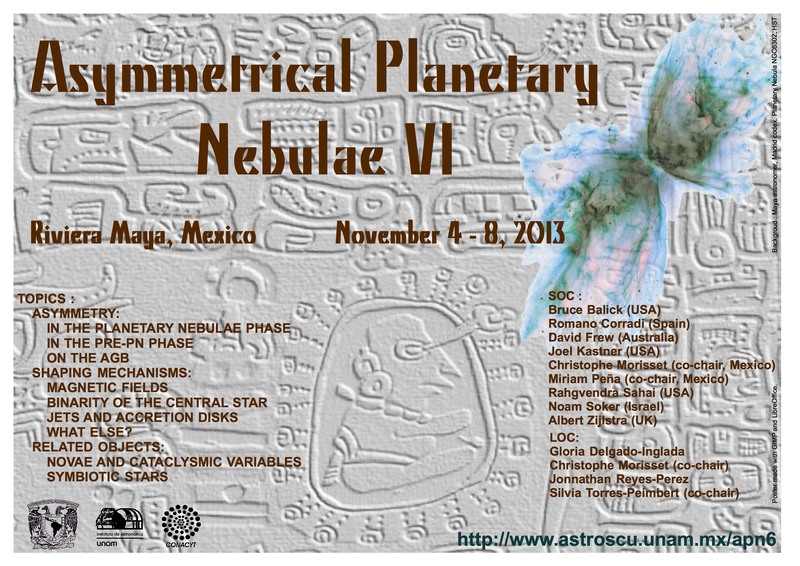 The next meeting of this series , scheduled for 4-8 November 2013, will be held in Playa del Carmen (Riviera Maya, Quintana Roo, Mexico). Most - if not all - planetary nebulae exhibit a complex structure, far from the spherical shape. The reasons for this dramatic change in symmetry, that occurs in early stage of the development of the nebula, remain controversial. The same physics operates in a variety of stars, from young (winds from young stars and/or high mass stars) to old (novae, symbiotic stars). The aim of the APN series of conferences has been to offer the opportunity to anyone involved in the study of asymmetric planetary nebulae (and related objects) to discuss the latest results obtained in this field. For each topic, the program will consist of an invited review, 5 to 8 talks, and posters. It is intended to devote a significant part of the meeting to discussions. The conference will take place in Windham Hotel in Playa del Carmen – Riviera Maya, Quintana Roo, Mexico. Pre-registration: before 1 August, follow this LINK. Submission of abstract: before 15 August following this LINK. Mexico), Raghvendra Sahai (USA), Noam Soker (Israel), and Albert Zijlstra (UK).